In Ireland, one of the most prosperous countries in the world, a mother has been forced to beg for her child’s life. Brendan, a 13-year-old boy with scoliosis, as well as cerebral palsy, has been on the “urgent” waiting list for vital spinal fusion surgery for over 14 months. On Thursday night, Brendan’s mother Tracy took to Twitter to share photos of the increasing damage Brendan is enduring as he waits endlessly for the surgery at the Children’s Hospital in Crumlin. Tracy spoke to JOE to describe just how agonising the last 14 months have been. “If you or I had scoliosis, that would be hard enough,” Tracy said. “But if you had no muscles, in your abdomen, your back, your sides to fight against the curve — that’s Brendan. He’s literally being crushed to death. “He was first placed on the urgent, I laugh, “urgent,” waiting list on 1 June, 2017.” Over 14 months ago. Asked how the healthcare system justifies this waiting times, Tracy sighs hard. 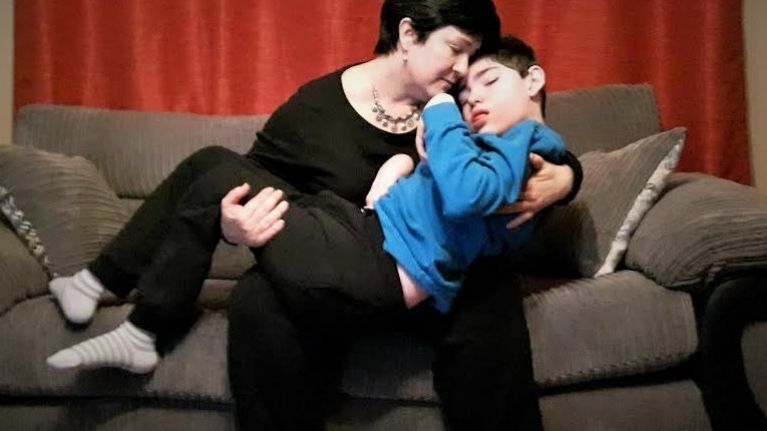 “At an appointment in May, it was said that he would have his surgery in most likely July, and if everything went well, he’d be ready for the start of school this autumn” Tracy said. “July didn’t happen. I was told, it being summer, there were a lot of sports injuries, emergencies, that kind of thing, that bumped scheduled surgeries. But Brendan was never even scheduled in the first place. They just haven’t put him on the schedule. “We need to ask why and demand different. Something’s gone wrong, obviously. It’s massively dysfunctional, massively so. It’s inhumane. This is neglect. On Minister for Health Simon Harris, Tracy says he won’t reply to her emails directly. On Minister for Disability Issues, Finian McGrath, Tracy says he has not replied once to her, even though he has met Brendan before. Tracy is now waiting on the outcome of a special meeting that has been called at the hospital to discuss Brendan’s case, after 14 months of waiting. Tracy notes that the compression of Brendan’s body has begun to force wounds to open — which would disqualify him from surgery. This means that by waiting so long to act, the healthcare system may have made it even harder to operate on Brendan. There is currently a Go Fund Me page to help Tracy pay for suitable accommodation for Brendan, which is almost halfway towards its goal. “Brendan requires a properly equipped, suitably modified bungalow for his lone-parent mother to safely continue her full time 24/7 care of him, especially when that operation is completed,” the Go Fund Me page says. UPDATE: Tracy has confirmed that Brendan has been given a tentative date of October 8 for the spinal fusion survey, as a direct result of the social media pressure applied over the last 24 hours. This will partially depend on an anaesthesia review which will take place on Monday.